The 2009 GeoWeb Conference has come and gone once again. 2009 was special to me because we have started to see some really great GeoWeb enabled websites really take flight. Clearly many have stopped talking about how discovery and sharing of data should be done and have begun implementing it. I was lucky enough to see Jason Birch’s talk before having to go to the airport and now he’s posted his slideshow up on Slideshare. I highly recommend that you take a look at it and a look at the City of Nanaimo’s website to see that you don’t have to get all “SDI” to share data and have Google index it. Jason has a blog post that gets more into the details of making your data discoverable. While there is still discussions about OGC and “working with them”, implementors are not waiting for OGC to get their act together, nor are they waiting for INSPIRE or Data.gov to “lead the way”. I think one can sum it up this way, users are more important than standards. Consensus is hard to achieve and usually when people can agree on something, it becomes bloated and difficult to use. That isn’t to say that standards and standards organizations aren’t important. What it does say is if you want your data to get out to your users it is best to think of what works for them and not what ISO or OGC standard you can apply. So maybe GeoWeb 2009 is about doing something about all this great technology and then seeing the results. Jason’s presentation above clearly shows that if you take the time to implement good SEO and make everything discoverable, people will find your data and use it. ESRI, Oracle, Google (and I assume Microsoft, but they seemed to skip GeoWeb this year) are all working hard at allowing users to get data out of these systems (to greatly different degrees of course) and into the hands of their customers/users. Ron Lake puts on a great show and I was glad to both present and spend time with presenters all week. The new academic track looked really interesting with some real cutting edge stuff. As I said last year, the really great part of GeoWeb is connecting with people you have not met before. GeoWeb Conference does a really good job of bringing together Europe and North America to discuss implications of the internet on our business practices. The tile of this post references the one thing that did get everyone’s attention at GeoWeb 2009, the heat. Of course a cold beer with friends has a way to make all that hot air go away. 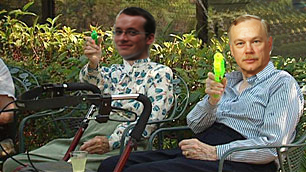 Ron Lake and Andrew Turner got into a water gun fight over GML.